Reliance JIO is conducting field trials by inviting people, But it isn’t open yet. If you are willing to experience JIO services “free Unlimited for 3 Months“, you need to buy LYF handset under “Jio Preview Offer“. LYD handset price starts from Rs 3999 . Here i will explain everything you want to know about pricing, handset and buying a handset really worth? Unlimited Local/STD Calls over VOLTE, Any Netowrk. Unlimited SMS Local/STD, Any Network. Unlimited 4G Data (Limited to 2300Mhz band 40 in some cirlces). You can use Personal Hotspot using LYF phone ( but you can’t misuse). Unlimited JioPlay to watch TV on Mobile. Unlimited JioBeats for Music downloads. 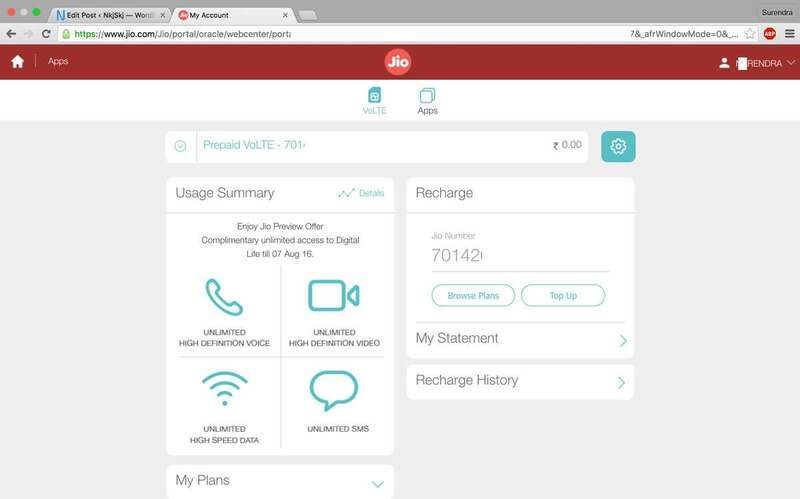 Unlimited Jio On Demand app for watching movies. Yes, you can’t use bundled Jio SIM card on any other handset, it will work only on LYF handset. So forgot if you are willing to buy this handset for sim only. LYF handset cheap quality phones, Does it worth buying? Yes, LYF handset are really cheap quality phone when compared to other budget phone in same pricing segment. These phones are overpriced, outdated and lack of quality when comparing to other budget smartphones. If you are pro Data user with bill of Rs 2000 each month, Go for it. But only using as hotspot and unlimited voice calling ( for voice calling you can’t use for business purposes as different business phone numbers, after porting it may help you. Although you can talk with family, friends and relatives unlimited all over india). I have consumed 180Gb data with max download limit 60Mbps and lowest 9Mbps. Voice quality is superior if you have good signal strength receiving on phone. In some cirlces Jio network is available on band 5 (850MHz) which will provide better indoor coverage for voice calling. Where Jio Don’t have band 5 spectrum, you may face indoor coverage problems with call drop. But soon Jio will launch services on sub-GHz band (below 1000 MHz frequency). So if you really want to enjoy blazing fast speeds go for it. But remember speeds will go slower as user base grows, i think average download speed will go down in near future.